There were a lot of eye-catching booths at San Diego Comic-Con, all promoting or selling comics, other books, clothing, art, toys, and various media properties, but there was particularly electric energy around a table for a game called Superfight. And I couldn’t resist picking up a copy of it. Superfight is a card game. While the black and white cards used to play it may remind the casual observer of Cards Against Humanity, this game manages to be both simpler and smarter. The core set contains a deck of white character cards and a deck of black power/weakness cards. While there are a variety of different “official” rules for playing, the gist is that two players draw some cards from each deck and select a combination that they believe will defeat the other character’s combination in combat. From there, anyone else present for the match becomes a judge as each player makes the case for the champions that have been created. As the debate goes on there is an opportunity for more cards to be drawn to further enhance the arguments for each side with the objective of tipping scales and drawing cards from the game’s expansion decks can determine the location of the contest or change it from a fight to some other sort of competition. When both cases have been thoroughly stated, the judges may determine the victor who may then go on to meet a new player’s combination of cards in combat. And so it may continue. I feel like I’ve had debates with geeky friends about who would win in a hypothetical fight between two fictional characters. There’s something strangely satisfying about those sorts of debates and, by tapping into that energy and setting some framework for those conversations, I think this game manages to comfortably straddle the line between party diversion and conversation starter. At a recent social gathering, I had my copy of the game on hand as an available amusement. 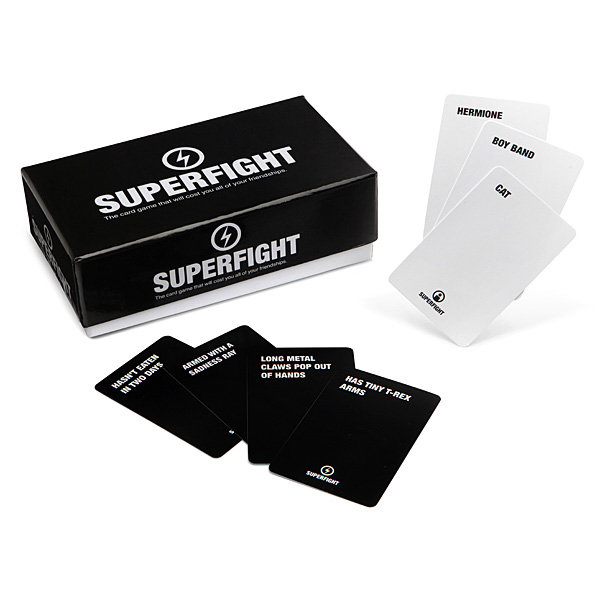 When asked about Superfight, I introduced the basic rules as I have above and as the debate went on, I varied the game as I saw fit, choosing when to introduce new powers and weaknesses to add twists. The premise is basic enough to let each player’s particular competitiveness and creativity shine. One player remarked, after a round, that while geekiness contributed positively to how a round might unfold, it was easy to imagine the players not necessarily identifying as geeks. Opponents who brought a different set of perspectives to a playfully competitive and downright silly debate could easily prove just as formidable. When in San Diego, I couldn’t resist further expanding my game’s range with the green and red decks, which contain G-rated and R-rated characters and powers/weaknesses, respectively. It was very entertaining to push players’ imaginations in different directions with those. One of my favourite things about Superfight is that it’s great for involving people who might be apprehensive about dice and colourful playing surfaces coming out at a social gathering. It can be as competitive or as casual as the gathered group decides. And the zany variety lends itself to breaking the ice and making entertaining callbacks later in the evening. Beyond social applications, the cards themselves could just as easily be used as random writing prompts, particularly for endeavours like NaNoWriMo (National Novel Writing Month). All in all, I’m very pleased with my investment and look forward to having the cards out at future gatherings.